Wedding Anniversary celebrations deserve all the wonderful gifts in the world. To make the couple happy, don't just send a single gift to them but a beautiful Combo because wedding anniversaries are all about pair. 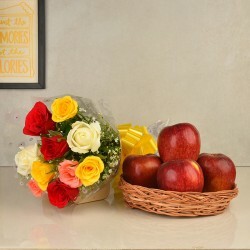 Make them feel blessed with beautiful gifts from MyFlowerTree. Get these gifts delivered at their door with our online delivery facility. Wedding anniversaries are about the celebrations of a couple, then, shouldn't the anniversary gifts be in couple too? On the wedding anniversary of a loved one, don't just go ahead with one gift when you can have an amazing combo at the cost of one gift. Discover beautiful wedding anniversary gift combos for that beautiful couple and send it to their home with our online delivery. Order our amazing wedding Anniversary Gifts and surprise the happy couple. Just like a husband and a wife, Flowers and Cakes, too, make a perfect combination which makes their combo the perfect wedding anniversary gift. 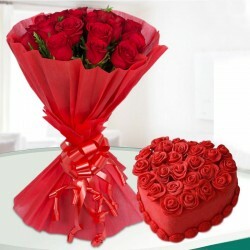 Romance as our main theme, our online florists have created the most aphrodisiac flower with cake combos. We started with Black Forest Cake as it is one of the most loved Cake flavours. Take a look at our Black Forest Cake combos like rose with black forest, yellow flower with black forest and Lilies with Black Forest. Red Velvet is another flavour that that is perfect for wedding anniversary celebrations. It is beautiful to look at and delicious to eat. Surprise the couple celebrating their wedding anniversary with combos of roses with red velvet cake, orchids with Red Velvet Cake and Gerberas with Red Velvet Cake. We also have some amazing anniversary gift combos made with Chocolate Truffle and Vanilla Cake. These are the best Anniversary Cake and Flower combos that you will ever find in India. No matter whether you buy them from our online or offline shop, we assure you that you will get the best quality. 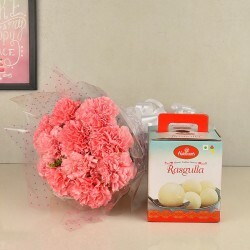 Buy the most unique flower and chocolate combos that you can ever find and celebrate your favourite couple's wedding anniversary. Our chocolate and flower combos are one of a kind as we have the most unique arrangements. 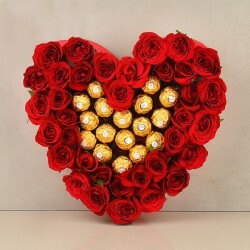 Instead of a box of Chocolates, go ahead with our Bouquets made of Ferrero Rocher or other chocolate and team them us with beautiful hand-picked Flowers. Go ahead with a combo of pink flower with rocher or a basket of rochers with assorted gerberas. The options available with us are endless. We also have towers made of chocolate which look absolutely beautiful with bouquets of gerberas. These are the perfect gift ideas which are available for you to buy online. Send anniversary combo gifts to that happy couple online with MyFlowerTree. If you are looking for something one of a kind for the couple, go ahead with our range of personalised gifts for couples. Get the couple's names and photographs printed on the top of our Mugs, Cushions and Cakes and send it to their doorstep. These gifts are truly unique and premium. We also have the softest teddy bears which are perfect couple gifts. Give our perfume and greeting card collection a chance and you will find the best things that will put a smile on their faces.